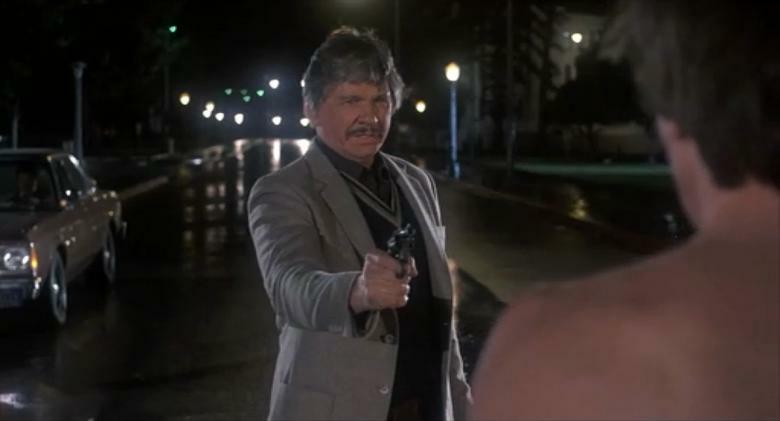 During the 1980’s, Charles Bronson became the poster man for Cannon films, after the Golan/Globus boys bought the rights to the Death Wish series. Along with legendary director J. Lee Thompson, they made a collection of films that, frankly, were not the in line with their back catalogue. Mainly exploitation cop thrillers, they were poorly written, lazily directed with Bronson virtually phoning in his performance. 10 To Midnight was one such film, a thriller which leaves a very bad taste in the mouth that, if it wasn’t so nasty, would be unintentionally hilarious. Paul McAnn is killing women. The cops can’t stop him, however, as he has air-tight alibis each and every time.Leo Kessler is the only cop who believes he is their man and along with his partner, Warren Stacy, he is determined to bring him down. No matter what he tries, McAnn is always one step ahead but when he starts threatening Kessler’s daughter, Laurie, he will stop at nothing to get his man behind bars. Watching this low-budget thriller, that wants to be both Death Wish and Dirty Harry but doesn’t have the script or the cast or even the direction, you feel slightly uncomfortable. Not because the film is particularly violent, although it comes at you like a very low-grade slasher horror, or how lacklustre the acting is. What is more disturbing is the reaction to the women in the film. They are most definitely the victims in ever sense of the word. McAnn runs around naked in order not to get blood on his clothes, making it hard to pinpoint the murders on him but his motives for these crimes are being rejected by his female work colleagues. Every one he meets instantly think he is a creep, apart from the police, who just so happen to be all men. He uses two young girls in a cinema as an alibi, by being as obnoxious and sexist as possible so they would remember him, as they watch the film, he slips out, kills a girl, returns for the end and then starts at them all over again. Those are the scenes that cause the most upset. What also is so upsetting is how the might have fallen. J.Lee Thompson was once a great director. The man who made The Guns Of Navarone, one of the greatest war adventures ever. Yet here, you wouldn’t have thought he’d ever made a film before. Lazy, drab scenes that sound awful and look cheap and nasty. Not a cinematic trick involved, just point and shoot. Some shots look like they are done in one take and then moved on. The same could be said of Charles Bronson. Once a big name in the cinema, his star slipped the moment he joined the Cannon empire, making film after film that wanted to be like his notorious 1974 thriller, Death Wish. Here, Bronson isn’t in half the film, with Thomspon concentrating on McAnn or his partner instead. when he does pop up, he grunts and groans and then does something incredibly silly that stops them from getting their man. It is a performance helped by a big pay-out. Look out from a small role from Kelly Preston, John Travolta’s wife. So ashamed she must have been, she is credited as Kelly Palzis. 10 To Midnight is pure exploitation but without any charm or class. It’s not just laughably bad (some of the dialogue is cringing) it’s just nasty and horrible and instantly forgettable. It’s as far removed from entertainment as a film could be. I have a soft spot for the films produced in the 80’s from Cannon. This isn’t one of them.